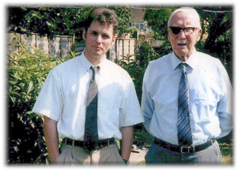 Allsops began life in 1984, but we can trace our family roots serving the funeral trade back to the early sixties. Garry's grandpa (HL. Pavitt) entered the funeral trade in 1963 as a timber salesman selling solid coffin sets. In 1968 he introduced Garry's father, Peter Allsop to the trade, starting as a sales representative selling veneered coffins, which had been recently introduced and were proving to be quite popular! Allsops itself was initially set-up as a one-man band by Peter, operating from his home in Brighton, with a spare bedroom as the office and the garage as a stockroom. Garry joined him a year later in 1985. 'At this time we were just wholesalers supplying local funeral directors, but business was growing and we needed more space'. By this time more and more enquiries were coming in from funeral directors outside our area, and in 1992 David Milner joined Allsops. 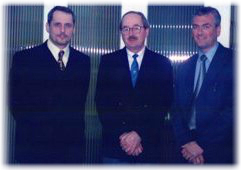 Peter Allsop retired in 2000, and Garry & David took up the reins. Allsops continued to grow and in 2009 the business moved into a purpose-built unit in Worthing, offering more space. 'This meant we could hold more stock and offer a faster turnaround on orders'. In 2010 Allsops launched their website, introducing online ordering to the funeral trade. The ever-growing range of products required more space, and in 2011 the unit next door was acquired. In 2013 a mezzanine floor was added to expand the workshop and storage further. There are no plans to stand still, and the next generation are already taking their places. Garry's daughter, Dolly Allsop, is the general manager, having been with the company since 2008, and oversees the day-to-day running of the business. His son, Harry Allsop, is the website and IT manager. 'We are now 4th generation supplying the funeral trade'. Allsops fleet of vans visit and deliver to customers in London, the South and the South East, whilst a next day carrier service is offered to other parts of the UK mainland. 'Our interior linings and other soft-goods are made in the UK in our own workshops. We are all very proud of what we have achieved in 30 years, and are very aware that without our customers' support we could not have achieved any of this. We will continue to look at ways to improve our service and offer more choice and better value to our customers'.